Amrapur overseas throws bring an old-fashioned look with a modern twist with decorative fringe. Jazz up your favorite sofa or daybed with this incredibly soft throw blanket. 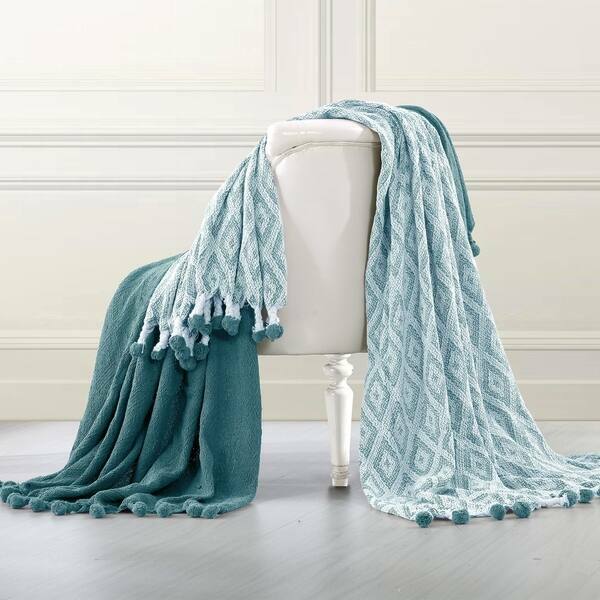 This 100% cotton throw with pom poms has a very chic and trendy look, throw over a couch or chair to add a splash of color and provide warmth on a cold night. These throws are 50 x 60 inches, perfect for using to bundle up on a couch, as a decor piece, over a chair, or give as a housewarming gift. Paired in two complementing colors to match your style. This set has different color as in the picture, not as nice in reality. Also the texture after wash is unbelievably coarse. Not to mention how much it sheds in terms of lint when washed and dried. Almost blocked my dryer duct. Would not recommend. I have comparison of this one with some other Indian made brands blanket here from Overstock, and this one is the coarsest in material after wash. The other blankets I bought also shed lint when dried, but the texture after wash is still soft and cushy. I really do like these throws. First it comes with two. A solid color and then a chevron print. I picked the teal blue, a bright color. Enough to pop but not to overwhelm. I am using the throws for chair covers, and they are perfect. They're made of cotton so they wash easily. They're not thin so they'll wear well. I am really happy with my choice. And the price can't be beat. I would and have recommended to my friends and family. Very pretty throws! I love how modern they look. Beautiful throws! Perfect weight. We use them on chilly nights and as accents on my chairs in different rooms. I really like the maize throws. Being a set of two encouraged my purchase. The color turquoise was the main reason. The actual color is much darker than I thought it would be, hence, my reason for only four stars. But, it still accents the decor in my chosen room. The fabric is also good. Not itchy and doesn't shed. Yes, I would definitely recommend this item. I ordered the pink/fuschia two pack. The colors are true to what was shown. The pom poms on the end add a little bit of detail. I needed a solid pink/fuschia throw for a guest room and this was perfect. The price was excellent and will probably give the patterned one as a gift. I really like the look of these throws, washed them before I placed them on the couch. I have these hanging on a decorative ladder in my living room. My children loves the added warmth these provide when they are lounging around on the sofa. I love the quality, colors, and the price. I had been shopping around for a specific color and material and being able to get 2 for the price of 1 was just a bonus. Another purchase that I am pleased with. Very pretty set of 2 throws - I ordered in Pink and they look great as an accent throw. They are not very soft, though, but that is fine for my purpose. The only grows were the color I was looking for, but when washed they did shrink quite a bit. Nice throw, but color is not well represented in pictures. Very nice throws. Warm, thick and very blue. They are darker in color than the picture so, don't plan on your other blues to match. Not sure I would buy them as gifts. Cotton, comfy. Nice set. Wash separately in Woolite so the dyes won’t bleed. Sheds really bad and is easily snagged, pretty and warm, just be careful with it, cats love it too. Terrible quality!! I loved the colors and have struggled finding a gold that matches my decor. I received the blankets and washed them because they had a funny smell. I followed the instructions, but both blankets started falling apart and losing balls/pompoms. I am in the process of returning them, now. The color is not what I expected. It’s a little lighter than the pictures. It’s very soft and comfortable. I like both of the throws had to wash them first due to the fact they had a funny smell and ahead a lot but now they are great for throwing on the bed. Hubby lost his to our dog he loves it. It think it will look great in our country style farm house. Love the colors!